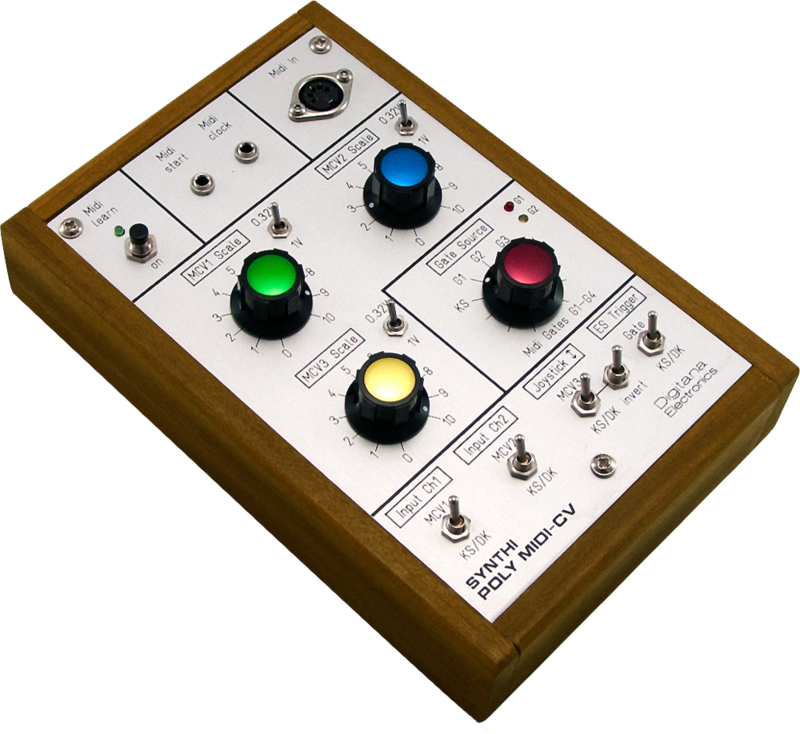 The Poly MIDI-CV interface is a custom designed multi-channel MIDI-CV module for use with a VCS3 Mk2. It is based around Marc Bareille’s fantastic multi-channel PIC micro controller based MIDI-CV converter called the ‘MCV876’. Control voltages CV1 to CV3 is relevant for the VCS3 Poly MIDI-CV. CV1 to CV4 are available for the four channel Synthi VCS3 Quad MIDI-CV Interface seen elsewhere on this website. Toggle switches allow independent switching of DK control or MIDI-CV control of each of the three independent CV input channels of the VCS3 matrix (Input Ch 1, Input Ch 2 and row 16 of the matrix). As an example of its use, three of the four channels are being used to inject CV1 to CV3 into the matrix (Input Ch 1, Input Ch2 and row16) and the fourth channel used to offer novel triggering modes of the ES. The unit derives its power from the VCS3 and is about 100mA mainly from the +12V side of the power rail. The unit will of course work with the Synthi AKS but we offer a special version for these in a textured black plastic trapezoidal case to match the Synthi AKS styling (see elsewhere on this site for more details).